Literary escapades enlighten and entertain in this boundary-pushing collection. This off-the-wall collection of character sketches paints eccentric women in darkening shades of realism. 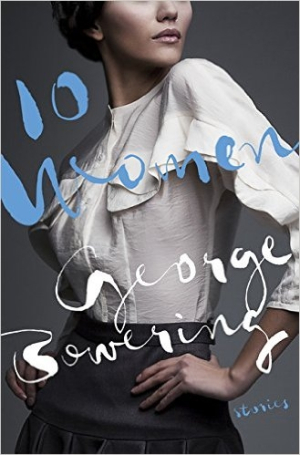 George Bowering’s 10 Women crosses the boundaries drawn between fantasy figures and mundane individuals, creating perfect balances and intrigues. Forbidden interludes, experiences that awaken, and pondering disclosures fill the pages of this unique book. Told from the viewpoint of interested and, in some places, strangely disinterested male narrators (with an occasional female exception), each story conveys a thought-provoking concept or a message that decimates a common preconception about heterosexual interactions. Vacillating between detachment and intense interest, the raconteur can be clinical or engaged, depending on circumstances. Subdued with the disillusionment of a randy youth and spiced with the snarky humor of a sage, these carefully crafted scenarios are infused with double entendres. One quick read may not be enough to decipher the real intent behind the bizarre characterizations and strategic maneuvering of these literary players. The contents page is a list of ten names. The personalities that emerge are unforgettable. 10 Women is word punch spiked with an intoxicating brand of comedy, and every woman in it is fortified with dizzying power shots. Memorable phrases linger beyond the morning after. At times, Bowering seems to be maliciously mocking his own creations, but a tempering voice reaches between the lines to calm and control the verbal attacks on these tempting targets. Descriptive passages are pared down with only the potent essence extracted from what could have been an overabundance of verbiage, a result all too typical when placed in the hands of a writer less sophisticated than Bowering. He instructs by example, for reading his work teaches more than a year in the English department—his is a succinct, yet formidable style. 10 Women is a fictional compilation of lessons gleaned from relationships that left a lifelong impression. Bowering may have allowed his personal encounters to influence these candid snapshots—an admission that his back cover blurb hints at playfully—yet he leaves it to his critics to decide whether he is serious. He possesses a strong command of language, along with an appealing ability to downplay, even poke at, the unfortunate protagonists in his stories. His literary escapades enlighten and entertain, allowing an eye-opening glimpse of liaisons that do not always play by an established set of rules.